As far back as we can remember, the last true good sports coupe developed by Lexus was the SC300 before it was replaced by the SC430 which turned into an unattractive, slow, unbearable driving machine that was loved by golfers wives. After 5 years since its last generation in 2010, Lexus is dipping their hands into the honey pot again trying to hit the luxury sports coupe niche with the introduction of the RC350 series. Much like the RC-F, the RC350 symbolizes video game like designs and an edgy style of modern intentions. Even in our classy Ultra White paint, the RC350 managed to turn heads luring pedestrians to admire its exquisite Rioja Red Nuluxe interior. With the addition of the F SPORT Package ($3,985) we get Lexus’ infamous pavement-eating black spindle grille and a set of feisty 19” smoked alloys wrapped in summer tires. The RC350 is everything you’d expect a Lexus to be – it’s quiet, comfortable, and a wonderful place to be. Similar to the IS350’s interior design, everything has it place full of high quality, soft touch materials. Being a coupe the place to be is in the front as your concord with ultra-comfortable body-sculpting heated and ventilated seats while hypnotized by the TFT digital display cluster. As usual, with any coupe the back seat is meant for children – if you can convince them – they are still comfortable with a deep setting and decent thigh support, but very little head room. Having the Navigation System with Mark Levinson Premium Audio ($2,610) is a good option to opt for. The system itself is intuitive and receptive to the driver needs and features a fantastic back-up camera. What we don’t care for is the new touch pad interface verses the old mouse-like pad – its cumbersome, difficult to use, and is distracting. Under its glimmering body, much is the same to the brawnier RC-F, minus the barbaric 5.0-liter V8. With a good use of laser welding, addition of spot welds and strengthening beams, the chassis is tighter than an accountant’s fun fund. This of course makes the RC350 stronger and more rigid, but also unfortunately heavy… very, very heavy. Tipping the scales near the 4,000lb mark, the RC350 is heavier than most of its competition, which reflects in its numbers. The RC350 uses the Toyota typical 3.5-liter V6 (similar to the ones found in the Toyota Camry), Lexus squeezes out a respectable 306 horsepower from its V6. This is where the RC350 is all growl and no bite as it takes about 5.7 seconds to 60 mph through an 8-speed autobox. While the figures on paper don’t look too bad – after all it manages to hustle into traffic quite briskly – the RC350 feel heavy and clumsy and in manual mode the 8-speed transmission feels dimwitted and unresponsive, like it’s on vacation. On other end of the stick though, a sports coupe is more than propelling in a straight line – on the back country roads, the RC350 starts to make a compelling case. With the Variable Gear Ratio Steering ($1,900), the RC350 handles like a dream – every turn is crisp and responsive from the comfortable thick leather steering wheel. The F SPORT tuned Adaptive Variable Suspension system has been engineered to be a comfortable Lexus cruiser so you can enjoy the drive to work, but also uses dampers that adjust to the road conditions and your speed giving you a constant dynamic feel for every corner. As it’s no surprise, anything with the word sport in its vocabulary is an automatic note for bad fuel economy. Surprisingly we were pleased with what the RC350 as we achieved 20 mpg in the city with a combined average of 22 mpg. 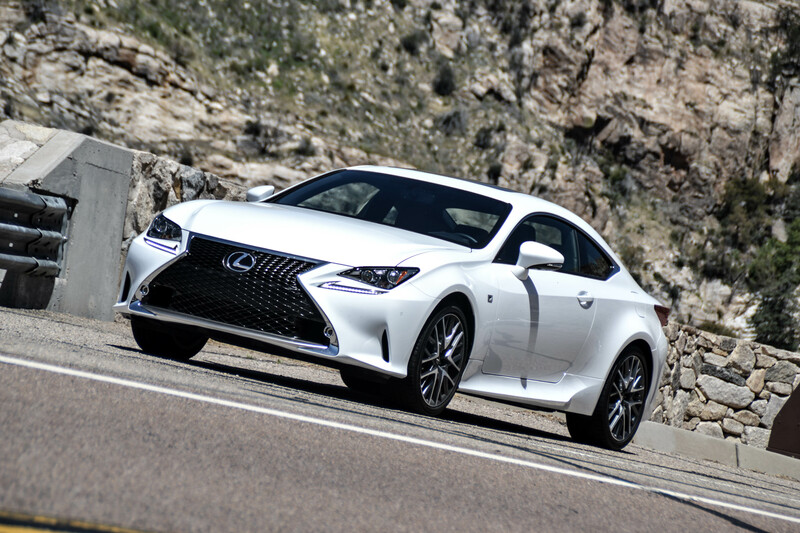 EPA rates the RC350 F SPORT at 19/28/22 (city/highway/combined). Using Premium Grade fuel, the RC350 will easily travel 330 miles. Sitting right about 54-grand, the RC350 F SPORT is a bit ridiculously expensive. For that, we’d rather go for the much more entertaining four-door IS350 F SPORT and save a few grand and a few pounds. As a back roads weekend cruiser the RC350 F SPORT has that fun value we look for in sport coupes – it however still needs to shed some weight before it can properly compete with its competitors. I wish I’d taken this one for a spin, but I have a feeling I’ve already been tainted by driving the ‘barbaric’ RC-F. Thanks for coming on the Mount Lemmon drive as our certified Camera Car!